Four NDFB(S) militants were apprehended in a joint operation by the army and Assam police from Gohpur near Assam Arunachal Pradesh border in Sonitpur district on February 19, 2015. According to police sources the NDFB militants were rooming in the forest area in Gohpur sub division with arms last few days in the dense forest near bordering area. Manabendra Dev Roy – Superintendent of Police Biswanath Chariali – said that the militants were apprehended with one 7.65 pistol and 6 round live ammunitions. 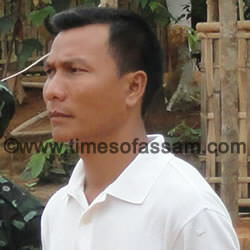 The arrested militants are Rohit Narzary, Prasen Basumatary, Ashish Basumatary and Rajib Uzir. Police also recovered some increments documents along with some mobile sim cards and handsets from the militants. In Biswanath Chariali altogether 13 NDFB(S) militants have been arrested by the security forces and police after the December 23, 2014 carnage. The NDFB(I K Songbijit faction) militants are presently taking shelter in outside the state and in interstate bordering remote places where the security forces were unable to movement, a reliable sources said that now several cadre were taking shelter in Assam-Arunachal Pradesh border. Police said the militants were apprehended from Rangajan village about 12 km from Gohpur town. Gohpur is about 155 km from Tezpur and 335 km from Guwahati. The four militants did not confide about the incident of December 23, 2014 in Sonitpur district and the entire case his being investigated by National Investigation Agency(NIA). The NIA taking Phulbari incident case where 30 innocent Adivasi people were killed by the NDFB(S) militants under Biswanath Chariali police station in Sonitpur district.